Cherries. Oh cherries. You make me smile. To be honest I don't think cherries are in season, it's usually Summer when I see them in the shops, but for some reason I found some beauties down at the local grocer. 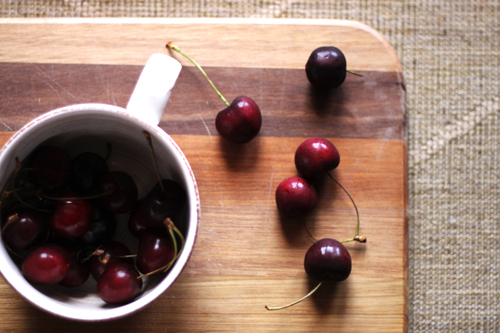 Cherries always remind me of Christmas (this may apply to most Australians). A couple of days before Christmas, my dad would come home with a big box of cherries, which we weren't allowed to eat them until Christmas day. This was kind of a lie, because I would always catch people sneaking a few in when no one was around. I did. When it came time to eating them there would then be a fight over who had the most. Papa of course ate the most, then would try and hide his pits and twigs so it didn't look like he had many. It didn't work. We all knew. He's not a good liar. 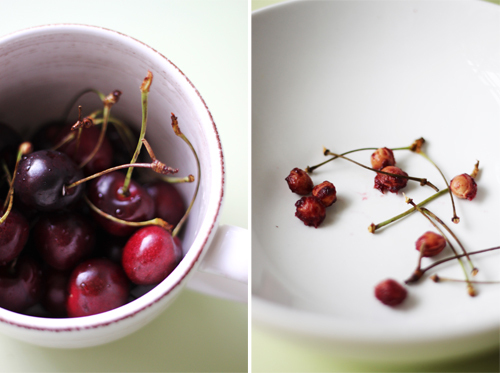 So at home with these cherries I thought I should maybe bake something sweet and yummy. Then I ate one. Then the rest. Cherries definitely mean it's christmas time. They always taste so good after too much christmas lunch.